Japanese written correspondence is different from what is done in the West, and it often much more formalised as well. Take the well-known nengajo New Year’s cards for example. You send them to basically everyone you know or who has done you a favour in the last year, and express your hope of continuing new relations for the year to come. If you send them on time (between December 15 and 25), Japan post will take care that they are delivered on January 1st. When people are in mourning, they are not supposed to send (and receive) nengajo, so they send mochu hagaki mourning cards in the beginning of December to alert everybody of the situation. I did that with my friends last year, even though they all knew that my grandmother had died and would not have sent me a nengajo anyway. Instead of nengajo, people often send so-called kanchu mimai winter greetings during January. They are slightly less formal and can be sent for any reason really, but still should be sent some time before Setsubun in the beginning of February. This year, I am sending kanchu mimai to all the shrines I visited as a highlight in 2018. A friend of mine suggested this instead of sending nengajo, partly because of the mourning part (even though the shrines would not know that) and partly because she thinks that they would probably receive hundreds (thousands?) of nengajo, and mine would go under. 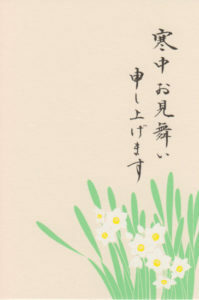 So, I have bought a pack of kanchu mimai cards with a simple design with spring flowers, and as customary, my greetings will go on the front of the card. I asked my friends what to write, and I chose something very simple and short, so that it won’t take hours to write all this. I am not sure I will be able to get it done this week, we will see. By the way, there is an equivalent card for summer, a summer greeting, called shochu mimai which can also be sent for any reason, really. Interestingly, the idea of sending postcards from holidays has never caught on in Japan, maybe because their holidays are so short anyway? In these instances the Japanese prefer to bring small omiyage presents. This entry was posted in plans and preparations by Iris. Bookmark the permalink.